EasyTrails GPS is unable to get the GPS signal while others GPS apps, included EasyTrails GPS LITE, works correctly. What shall I do?First, make sure you have granted to EasyTrails GPS 4 the permission to determine your location. Open the application Settings, choose General and then select Location. EasyTrails must be “ON”.Otherwise, delete the app from your iPhone and download it again from iTunes/Appstore. Don’t worry: you won’t have to pay again, this operation will be totally free. Remember: before to do this, export (in GPX format) your tracks and waypoints to be able to re-import them once you have again EasyTrails GPS on your iPhone, otherwise you are going to definitively lose them. I’m always waiting for a valid GPS signal. What I can do?Before starting, we must ensure that all prerequisites of theapplications are met. Obviously, your device must have a GPS receiver. Like we wrote in the iTunes page, only iPhone 3G, 3GS and 4 have a built-in GPS receiver, so on the iPod or on the first-generation iPhone the application doesn’t work “as is”: you need an external receiver.Said so, we must ensure that the GPS receiver is working. To be sure, open the Maps application and position your iPhone outdoor without barriers (i.e. : the iPhone must see the sky). Then wait for a few minutes: can you see your current position? Warning: the Maps application use also the GSM/UMTS cell to detect your position. You must be sure that it derives from a GPS signal: the blue radius around your current position must be close to ten meters.If you obtain a valid GPS position in the Maps application, switch to EasyTrails GPS.If this trick was not enough, restart your iPhone. Can I change the units of measurement? (E.g. : km/h to mi/h and so on.)Yes. You have to go in the Apple’s Settings application (the one in which you can turn on/off the airplane mode, the WiFi, the bluetooth, and so on). 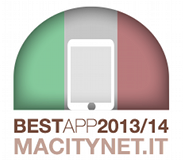 Scroll down until you will find a list of applications, including EasyTrails GPS: from here you can change the unit system. Can I use EasyTrails GPS while I’m using other applications?Yes. 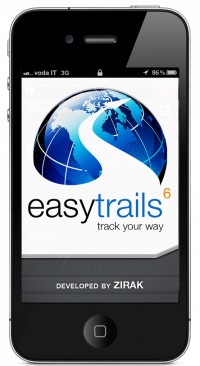 EasyTrails GPS 4 supports the multitasking, so you can make a phone call, use the iPod or the Nike+iPod and other applications while EasyTrails GPS continue to record the track. How can I improve the battery life while using EasyTrails GPS?Battery life using EasyTrails GPS is far longer than any other similar application, though you can improve it by using some simple trick. If you are not using the screen to view the data you’ll better turn it off with the “sleep” button of your iPhone. You should also turn off Wi-Fi and 3G connectivity as they are very expensive in terms of battery life. Another thing you should avoid is to turn on and off the screen many times as this operation causes peaks in power consumption. Which applications can read the tracks exported with EasyTrails GPS?EasyTrails GPS exports the tracks in three standard formats: GPX, KML, CSV so it is fully compatible with every application which uses these formats, like Google Earth/Maps, SportTrack (Windows), TrailRunner, RubiTrack (Mac OS X). Can I close EasyTrails GPS without losing the current track?Sure! EasyTrails GPS will pause your track and on the next run you will be prompted to resume or discard the previously paused track. Pauses and resumes points con be viewed on the maps thanks to special placeholders. Do I need an active Internet connection to register a track with EasyTrails GPS?No, absolutely. We use the application in the high mountains, where connectivity is absent, and we know how important it is that the application is working even under these conditions. Do I need an active internet connection to view the maps?No. EasyTrails can cache some maps relative to a specific area into it’s internal memory, so you can view the maps even if you are not connected. For example, if you want to go for a walk in an area not covered by Internet, you can visit the map of that area the evening before, so it will be available during the walk. Why cannot I get wi-fi sharing to work? Also, make sure not to enable / disable wi-fi sharing repeatedly as that can cause connection issues. If it still won’t work after following this advice, it is possible that something on your network (for instance, a firewall) prevents wi-fi sharing from working correctly.